Technomotive does not assume any responsibility for the use of this document or its information. Here is a handy table which you can print out to record your ECU information. As long as you have your ECU open, you might as well record this information so you will have it available if you order an ECU upgrade. Locate the ECU. 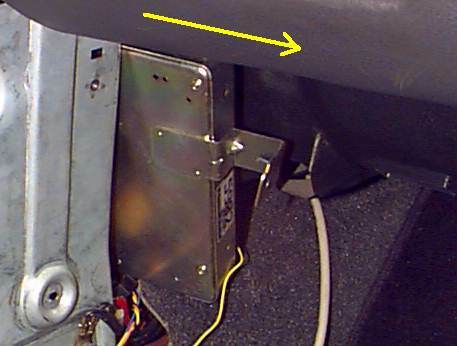 Figure 1 shows the ECU in the center console, underneath the radio. To get to the Figure 2 views below, you will have to remove the center console carpeted kick panels from both the driver and passenger sides. Unplug the ECU. Figure 2 is a view of the ECU if you could see the front of it using x-ray vision from the front bumper. Note that the connectors have release-tabs pointed towards the front of the car. It is a bit difficult to figure out how to get the plugs pulled at first, so go slowly and wiggle the plugs out carefully. You might find it easier to skip to the next step and remove the plugs after the ECU bolts have been removed. Unbolt the ECU.Figure 3a is a picture from the driver side and Figure 3b is a picture from the passenger side (your views might be slightly different depending upon stereo equipment options installed). The passenger side picture shows a lot of wires that were added for a rallye computer that most likely won't be in your car. Remove the ECU. First, shake the ECU a bit to get it off the notch tabs. Then, slide the ECU out as show in Figure 4. 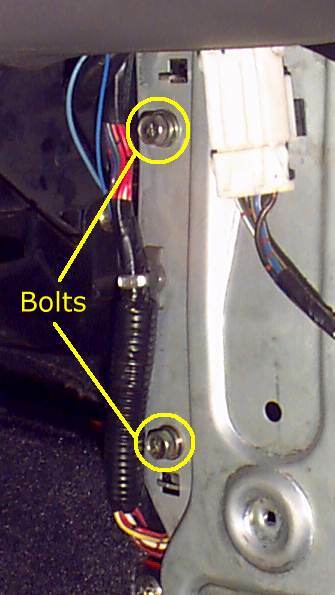 There are three bolts that hold the ECU in place (circled in yellow). When removing the ECU, you might have to wiggle it around a bit - there are other wiring harnesses in the area, making for a tight squeeze. Open up the ECU. There are four screws on the outside of the case. Be absolutely certain that you are using the correct size Phillips screwdriver. For some reason, they put tons of torque on some of the ECUs screws. The wrong size head will lead to stripping the screw heads. Check for the EPROM. Figure 5a shows an ECU with an EPROM which has been circled in red. Figure 5b shows an ECU with no EPROM and has a blue circle indicating where the EPROM should be. 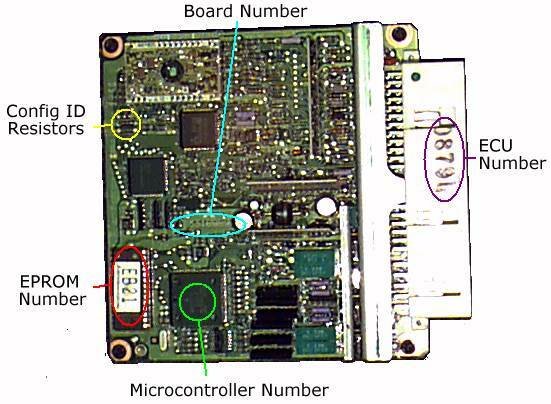 If you have no EPROM, any ECU upgrade will involve the use of a daughterboard which plugs into where the microcontroller chip is (green circle). Gather part numbers. 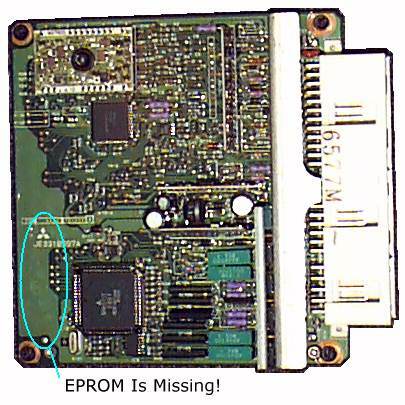 The EPROM in Figure 5a has an EPROM number of EB21 (circled in red). The microcontroller number is circled in green. We are interested in the number of the form EXXX. On this particular ECU, the number is E853. Ignore the numbers "MH6111" and "76C75T" - these are internal Mitsubishi part numbers only. In the middle of Figure 5a, there is a board revision number (circled in blue). This ECU has a rev number of JE331B989A. 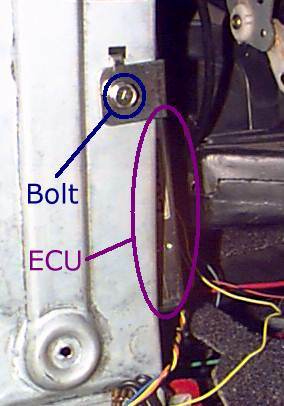 There is also an ECU part number stamped on the ECU harness connector (circled in purple). This ECU has part number 0879E. Check the ConfigID. There are two configuration-identification resistors. 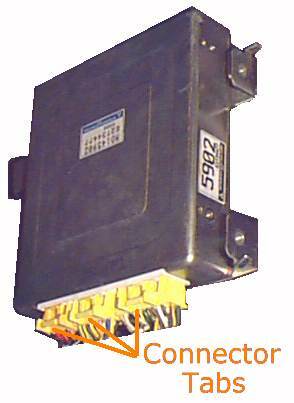 The existence or absence of these resistors let the ECU know things about the engine it will be controlling. In this way, Mitsubishi can build one ECU, solder one of four different resistor combinations in, and re-use that ECU for four different engine packages. These resistors are R129 and R130 (circled in yellow in Figure 5a). Please note whether or not there are resistors soldered in at those two locations. You are done! Reverse the above steps to re-install your ECU. Remember that it is much easier to first plug the ECU in before installing the ECU bolts. You also might want to have a friend help you put the ECU back up on the tab holders.